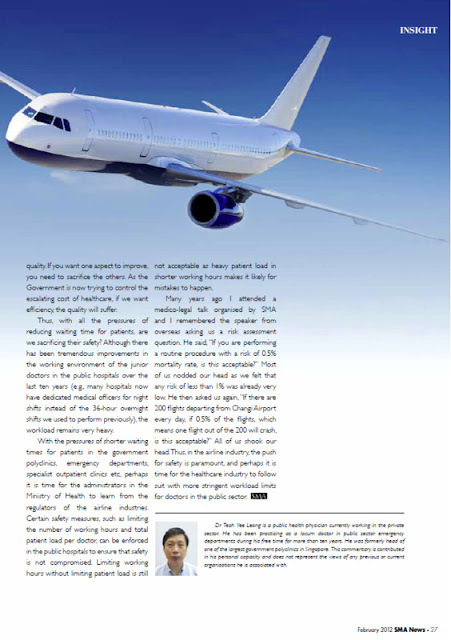 Daddy’s article titled "Lessons for Healthcare from the Airline Industry"
You are at:Home»Uncategorized»Daddy’s article titled "Lessons for Healthcare from the Airline Industry"
Daddy’s article titled “Lessons for Healthcare from the Airline Industry” has been published in Singapore Medical Journal. Its an interesting article which compares both healthcare and airline industry where service quality and safety are very important. 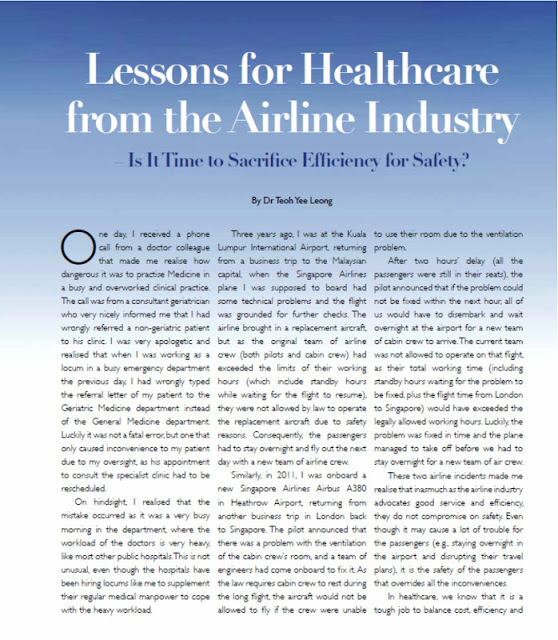 However, sometimes there maybe situations where the airlines have to sacrifice service over safety (eg postponing a flight if there are some mechanical problems on the plane or pilots/airline attendants exceeded their working hours) and this is where the healthcare industry should also learn. In any service line, there is a fine balance between : cost, quality (eg safety) and efficiency (eg good service). If you want to improve in one, you will need to give up another. For example, if you want better quality and better service, your cost will go up. If you want to keep cost stable, but increase quality, your efficiency will suffer. Thus in healthcare, sometimes, due to cost constraint (eg hospitals unable to hire more doctors due to cost constraint), as patients wants faster service (eg shorter waiting time), there will be risk of misdiagnosis or wrong treatment arising from overworked healthcare professionals. Daddy’s personal advice to patients is : “Do not rush your doctor, let him have enough time to look through your case, examine you and order the appropriate tests. If you hurry your doctor, there is a risk that he may make a mistake which can be catastrophic to you. Doctors are also humans, and humans do make mistakes, especially if they are under stress. If its emergency like you are in severe pain, you could inform the nurse first and she will inform the doctor to assess you and treat you briefly to relieve your pain, and review your case again when he has finished with other patients”.